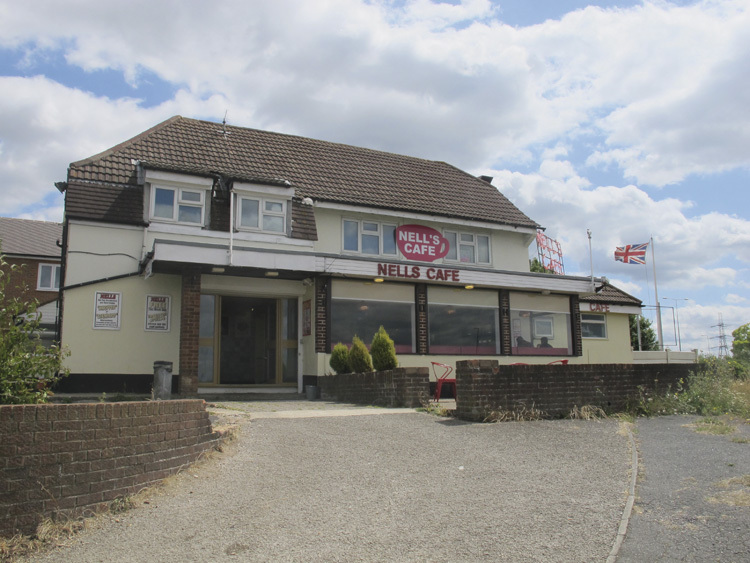 Perched on a small hill near Gravesend in Kent, right beside the A2, and just before it becomes the M2 motorway, is a small diner called Nell’s Café. Its location is five minutes from the M25, and three miles beyond the Ebbsfleet International station for the Eurostar trains. The exit you look for is Gravesend East, but the café can easily be seen from the road. Coming down the A2 from the London direction and also from the M25, take the exit and you’ll see Nell’s just across the roundabout at the top of the slip road. 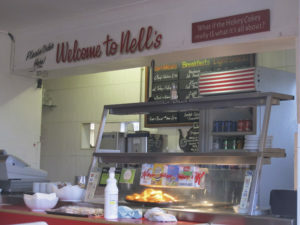 Heading towards London from the Medway area, you exit past a service station driveway, along a long slip road that runs parallel to the A2 and onto a roundabout where Nell’s café is located. Nell’s has its roots in the mid-1930s, when a local lady enterprisingly decided to set up a traditional ‘Tea shoppe’ at the end of her garden, from which she served refreshments to motorists travelling along the busy trunk road, then known as Watling Street. It would later become the major dual carriageway, A2, one of the two major routes to the Channel ports. Nell’s has long since morphed into a 1950s-style English interpretation of an American diner, complete with a Union flag flying outside. The café recently starred as a location in the BBC TV drama ‘The Interceptor’, an eight-part series about a surveillance team tracking Britain’s most wanted criminals. So what’s this tearoom-turned diner like inside? A bit tired in places, with a slightly scruffy car park. Inside it’s clean and tidy with typical diner décor: cream plastic tabletops and chairs upholstered in bright red or golden yellow, the colours of ketchup and mustard sauce. On the walls are enamelled posters featuring the Beatles, Laurel and Hardy, and Bird’s custard. There are also tables outside for warm weather dining. The toilets were spotless. A Standard breakfast, comprising fried egg, bacon, beans, sausage, tomato, fried bread, orange juice, tea or coffee, and also bread and butter, is good value at £5.99 for the lot. Or there’s the Whopper at £6.90 with several extra items. A roast beef and Yorkshire pudding, or roast turkey and stuffing main meal is keenly priced at £7.90. On our visit, during a busy lunchtime, service was swift by cheerful girls dressed in black tee-shirts which proclaim them as ‘Nell’s Angels’, with fun hot dog motifs.